Welcome to a topic that no one likes to think about, but everyone wants to know about -- Capital Gains Tax in Mexico! There is much confusion surrounding the topic, and it exists is for good reason. The tax codes have been changing and subject to gray areas/interpretation. IMPORTANT: This scope of this article covers residential properties owned in a deed or in fideicomiso. Commercial and rural properties, and/or those owned by a Mexican Corporation are subject to a different set of tax codes!! The Capital Gains Tax in Mexico is a Federal Tax known as Impuesto Sobre La Renta (ISR). More accurately, ISR is an income tax (not a capital gains tax), as it is assessed like any other income to an individual. It cannot be rolled over into another investment as it can in the U.S. It is payable by the seller to the notary at the time of closing. So, rather than confuse or mislead, from here on out I will refer to this tax as "ISR" -- it's proper name. This tax is assessed on the amount of income (or gain, which is where the confusion of terms arises) that is realized through the sale of a property. This amount increased from 28% to 30% as a result of the new 2010 tax reforms. The percentage is scheduled to return to 28% in 2014, but by then it will be on the next President's watch and for him/her to decide whether to reduce the tax as scheduled. This option is most commonly the lower of the two values, and is therefore the most common formula for assessment. Recorded Sale Price: This is the value that will be recorded in the deed (escritura) at the time your property is sold. Adjusted Recorded Purchase Price: This is the value that was recorded in the escritura when you purchased the property that is adjusted for inflation by the notary. Why is this done? If you would merely compare the sale price to the purchase price, you would not be "comparing apples to apples". For example, if I paid for and recorded a property at $50,000 USD in 1980 and am selling in 2011 for $150,000 -- it would not be fair to calculate my gain as $100,000 -- because the value of $50,000 back in 1980 was higher than it is today, due to inflation over time. So, the notary will adjust your originally recorded purchase price up, using a standard schedule of annual inflation, to factor in inflation and thereby make the two numbers comparable. The good news is that there are several deductions that can significantly decrease the amount of ISR you will pay! The following expenses that you incurred while purchasing the property are deductible: Notary Fees and Some Federal/State/Municipal Taxes and Fees incurred at the time of purchase. The following expenses that you will incur when you sell the property are deductible: Real Estate Commissions, Notary Fees, Some Federal/State/Municipal Taxes and Fees incurred at the time of purchase. Capital Investments that you have made to the property in construction, remodel, etc. are also deductible. These investments are projects that added real value to the property -- i.e. a plumber's bill for a leaky faucet wouldn't count. IMPORTANT! In order to for the above services to qualify as deductible services, you would have had to pay IVA sales tax. If you didn't (i.e. you paid for the services "under the table") then they will not qualify as a deduction. This makes sense right? If you didn't pay taxes the first time, they will not then allow you to use them as a deduction later. So, get your facturas or receipts for these services! These facturas or receipts should include: Your name, Property Address, Date, The Name & Tax Number of the Person or Company issuing the Factura or Receipt, and the Tax (IVA). If you don't have facturas for your capital improvements, an official appraisal can be performed as a substitute. Can I Exempt my Residence from the ISR tax? In some circumstances, the law allows homeowners to partially or completely exempt their residence from the ISR tax. 50% or more of total income in a calendar year is derived from Mexican sources. 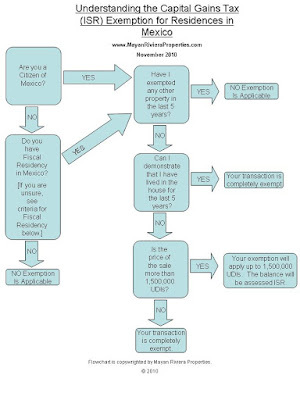 In either scenario, foreigners would, by default, be required to have a FM3 or FM2 endorsed by a Mexican corporation that they own or to whom they are employed. Additionally, they may need to produce tax documents from SAT (Mexico's tax authority) to verify their Mexican source of income or center of professional activities. Have You Exempted Any Other Residence Within The Last Five Years? If you have, you cannot be exempt. Note that this does not mean that you haven't sold another property within the last 5 years, only that you haven't exempted one within that time. If you haven't exempted within 5 years, then you will be eligible for some form of exemption, and the amount of time you have owned the home, will dictate whether or not there is a cap on the amount of ISR you will pay -- which takes us to the next question. UPDATE: The law is now 3 years, not 5. Valid, Official Identification -- Credencial de Elector for nationals. FM2 or FM3 for Foreigners. Is the Price of the Sale More Than 1,500,000 UDIs? "UDI" stands for Unidad de Inversion or Investment Units and is a number based on an index of funds, rather than relying on the ever changing peso. At the time that this article, 1,500,000 UDIs was equivalent to approximately 6,300,000 pesos. The notary in the transaction is responsible for collecting the taxes/fees due to government in transactions. [Click here for more info about notaries in Mexico.] If, during an routine audit, the government finds that a notary allowed an illegal/unjustified deduction or granted an exemption without sufficient documentation to meet the requirements as stipulated by the law, the notary is financially responsible for the difference. The notary's are currently mandated, by direction of the notary counsel, to apply the fiscal codes, in addition to the residency codes, when making ISR exemptions. The actual codes regarding ISR themselves do not clearly indicate whether both residency and fiscal codes are to apply in ISR exemption. If this mandate is changed in the future, non-citizens would only have to meet residency requirements to qualify for exemption purposes. AMPI Course: 2010 Tax Reforms. Given by Attorney Alfonzo Aranalde and Accountants Carrasco Garcia and Asociados. This article is copyrighted by Mayan Riviera Properties in 2010. Thanks for this article....but our condo manager is deducting "ISR" tax from the employees paychecks, he takes almost 10% for "ISR". Does this sound right to you? ISR is the income tax. The amount deducted as tax will depend on the amount that is received. It is a progressive tax scale that goes up to 35% for the highest earners. To know what amount should be deducted, you could consult with your accountant. ISR is the income tax in Mexico. 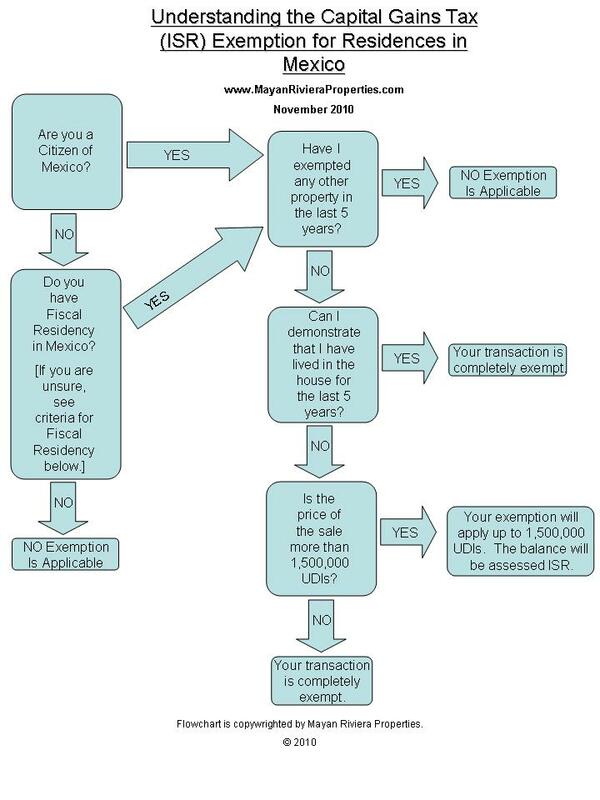 When you sell property in Mexico, it is treated as income and taxed accordingly. Some call the ISR tax which is paid on property sales "Capital Gains", but in reality, it is ISR. The ISR you pay as an employee is your Income Tax. The percentage that you pay is based upon the annual amount that you earn. You'll need to consult an accountant to ensure that your employer is deducting the correct amount of ISR. I would depend on which of the 2 formulas are being used. If it is formula #1 (above), it's based on gross. If it is formula #2, it's based on net.